The Presidents Council includes 16 presidents or chancellors from Division II institutions from across the country. 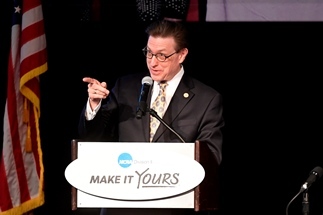 Olson will continue to hold a seat on the NCAA Board of Governors, the highest governance body in the organization, which oversees issues pertaining to all levels of NCAA-sponsored intercollegiate athletics. As the chair of the Presidents Council, Olson plans to continue and enhance the division’s efforts to foster high academic performance among its student-athletes and to sponsor initiatives that promote student wellness, both physical and emotional. Division II is composed of 308 colleges and universities competing in 24 conferences. Daemen is the only Division II institution in the Buffalo Niagara region. For the last three weeks, its men’s basketball team has been ranked in the top twenty-five in the nation.